Felicia Beard is the Director of Racial Equity Initiatives at the Community Foundation. In this role, Felicia is responsible for developing, supporting and advancing the Community Foundation’s commitment to racial/ethnic equity. She also manages the work of the Greater Buffalo Racial Equity Roundtable, a group of more than 35 community leaders from public, private, nonprofit and faith organizations committed to tackling racial equity in Western New York by expanding opportunities for all. 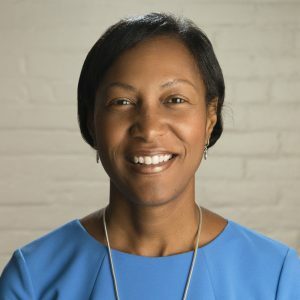 Prior to joining the Community Foundation, Felicia worked as a Manager at HealthNow New York Inc., the parent company of BlueCross BlueShield of Western New York. In this position, she oversaw the outreach and enrollment of individuals in Western New York into the New York State health insurance program. Previously, she worked as a Project Director for YO! Buffalo, an initiative of the Buffalo and Erie County Workforce Development Consortium, Inc. Felicia also served in leadership positions at Fillmore Leroy Area Residents, Inc. and Citizens’ Alliance, Inc.
Felicia received her B.A. in Legal Studies and M.S. in Applied Public Affairs from the State University of New York at Buffalo. She is a member of the Board of Directors of the Elim Community Corporation and the United Way of Buffalo and Erie County. Felicia is also a member of Leadership Buffalo and 2nd Vice President of the Erie County Chapter of Links, Inc.